Last week my mum and I had a girls day and went to explore some lavender fields near my parents house. 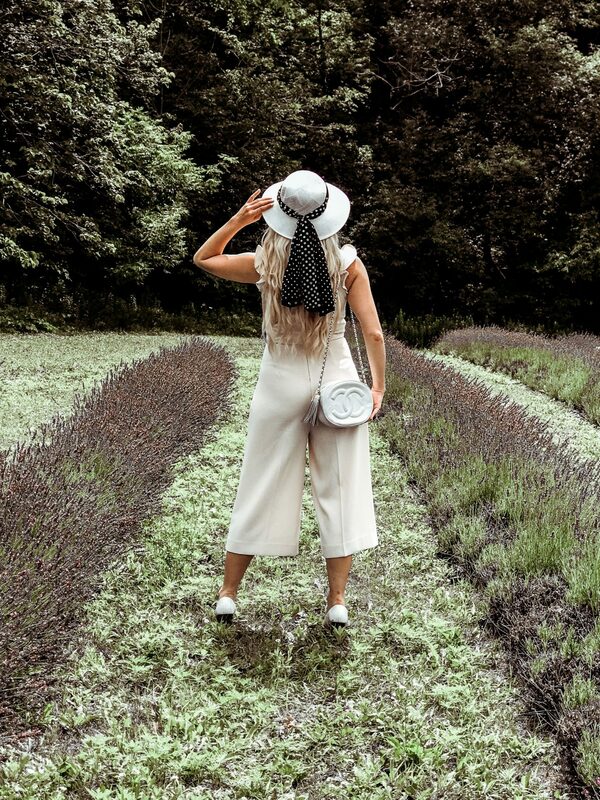 I have always been obsessed with lavender fields – they make me feel like I am in the French countryside. I wanted to wear an outfit that gave off that ‘French countryside vibe’ and this blush culotte jumpsuit was the perfect piece to style. I have been wearing culottes a lot this summer (ex: this work day outfit with striped culottes, or this weekend look with white denim culottes) but this is my first jumpsuit that has a culotte shape. Besides the culotte shape, what drew me to this jumpsuit was the notch neckline with ruffle sleeves. I always find that to be a flattering neckline and it is just so freaking adorable! The blush culotte jumpsuit is a great almost neutral piece in that you could wear it to so many things depending on how you style it. it would be great with simple pumps for a wedding guest outfit for example, and it could even be styled for work with the addition of a black blazer and black belt. It’s a really versatile piece. To create the french countryside vibe I wanted to go for on this particular day, I chose to add black and white as my accent colors and couldn’t resist adding in some polka dots. The hat and polka dot scarf are actually borrowed from my mum. Sidenote: My mum is so stylish. If you missed her ‘guest posting’ here on LegalLee Blonde go check out her post on style tips for young professionals. I also have to talk about my Chanel bag and statement ring – since to me these pieces really finished off the outfit. My Chanel bag belonged to my grandmother and is one of the multiple Chanel pieces I got from her when she passed away. My grandma was so stylish and I love getting to wear her Chanel purses and have that memory of her. I’ve linked up some similar consignment vintage Chanel bags below for anyone who is in the market! I’ve found ones that are really good deals – including one for under $1200! My statement ring is from Nissa Jewelry – which is a brand a PR company I work with recently introduced me to and I am obsessed. I have three of her pieces and definitely can’t wait to add more to my collection. So there you have it! My take on lavender field french-countryside-chic. I hope you like it! Oh and for anyone planning on getting this blush culotte jumpsuit – it does run true to size. I’m wearing a small. I’m in Croatia right now (as you may know) so be sure to follow along on my instagram for all of my trip adventures! I’ll also be back here with a new blog post on Monday that you won’t want to miss – it’s probably one of my favorite outfits of all time – so be sure to come back then! Until then, have a great weekend lovelies! I love this jumpsuit! These pictures really do scream French Countryside! I love Lavender fields too, they’re so pretty and just make the perfect backgrounds! Thank you so much Laura! Glad you like the post! Cute outfit! I love the all white look and your hat is the perfect accent to the overall look. I love how the scarf on the hat adds a little somethin’ extra. You’re looking fabulous!! I adore the French vibes here! That culotte jumpsuit is just too good! The entire photoshoot is so dreamy! These pictures are so cute. Love the jumpsuit on you. This jumpsuit is so cute, especially paired with these heels! Love this look, so gorgeous! This jumpsuit is so pretty! And I love that hat! Girl, you look GORGEOUS! I love everything about this look! The photos are stunning! I was actually just in Provence last week and visited some lavender fields, so I’m kind of obsessed with them right now! Ahh that must have been so fun!!! So chic! This jumpsuit and the way you styled it is the chicest lady! You’re so sweet Laura. Thanks girl! That jumpsuit is absolutely stunning! I love the photo location too! You look gorgeous! This is the perfect jumpsuit, looks so classic and fab! thank you so much Katya!